Many times revolutionary ideas are greeted by strong skepticism. The 1+1 and 1 vs. 1 training method is no exception to this phenomenon. Click here to avoid becoming a skeptic! 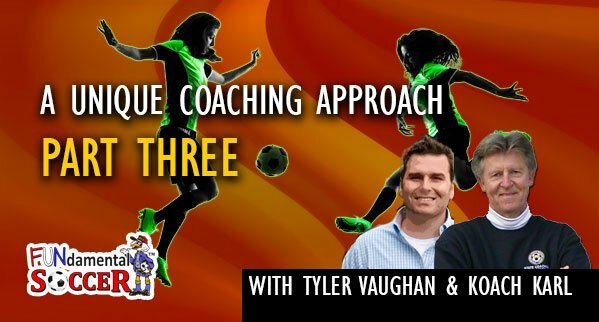 The extremely popular mini-series continues with Tyler Vaughn and Koach Karl discussing, in great detail, Steps 3 & 4 of the ‘9-Step Practice’. This unique coaching approach, when properly followed, has proven to swiftly improve players when compared to traditional methods. Players are taught that the Coach will/may Stop or Interrupt Play to make ‘Points of Refinement’. Perform ‘Theme’ at controlled speed vs. walking opponent(s). Environment that allows players to experiment with the ‘Theme’. Allowing ample time to concentrate on perfect execution of the ‘Theme’. At a speed where movement/action is slower to allow learning to take place. Perform ‘Theme’ at controlled speed vs. jogging opponent(s). Environment that challenges players while experimenting with the ‘Theme’. Allowing players less time to concentrate on perfect execution of the ‘Theme’. At speed where movement/action is faster to challenge learning taking place. Perform ‘Theme’ at controlled speed vs. game speed opponent(s). Environment that tests players while experimenting with the ‘Theme’. Allowing player to concentrate on perfect execution of ‘Theme’ at game speed. At speed where movement/action is dictated by the pressure of the opponent. Prepare to Stop the Action and make ‘Points of Refinement’ on the ‘Theme’. When in doubt put players back into previous Stage – Success is the Key! Let your players know (teach them) that stoppages for coaching will take place during this phase of the practice and that it is no reflection on their playing ability. Players are taught that the coach Will Not Stop or Interrupt Play to make ‘Points of Refinement’. ‘Free’ games controlled by the players. ‘FUN’ games controlled by the players. Prepare to allow the action to continue Without Stopping or Interrupting Play. Discipline yourself to know when to leave the players alone! Over coaching can often be worse than no coaching! Be careful, that in the haste of competing, technique does not deteriorate. Recognize fatigue and when it becomes a factor in learning. Include active/inactive rest periods when the activity is at a high pace. Take mental or written notes on who will need help (with the ‘Theme’) in future practices! Let your players know (teach them) that no stoppages for coaching will take place during this phase of the practice and that they are encouraged to fail their way to success.